Includes FAST TRACK entry to the park! FAST TRACK entry to Siam Park & Loro Parque! Children under 6 enter both parks FREE with this Twin Ticket! 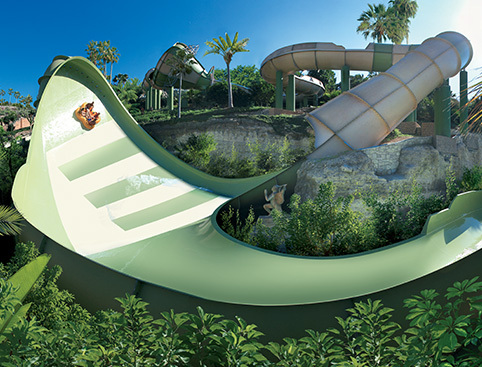 FAST TRACK entry to Siam Park! One extra day’s admission to either park! To book a Cabana: Select 1 Adult Ticket to book 1 Cabana for 4 people. To book a Villa: Select 1 Adult Ticket to book 1 Villa for 8 people. Our tickets can be used any time during your holiday! Jump the ticket queues with fast-track entry! Your ticket can be used any time during your holiday! This ticket is valid within a 14-day window from first use, so you don’t need to use it on consecutive days. Your ticket is valid over a 14-day period, so you don’t have to visit the 2 parks on consecutive days. The 14 days begin on the day that the ticket is first used. Return transport to Loro Parque from several southern resorts. 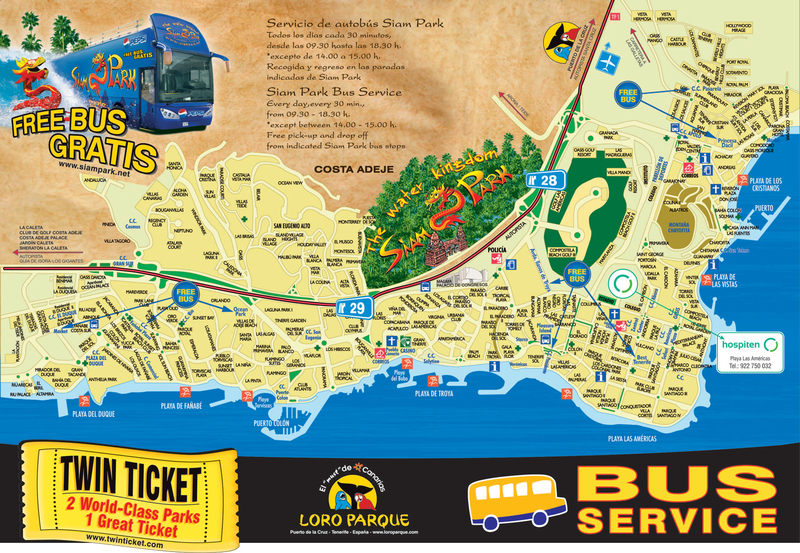 Click here to view the Loro Parque Bus Timetable. Transport to Siam Park is available via a free bus service from Los Cristianos, Playa de Las Americas and Costa Adeje – see the “Getting There” tab for more info. This ticket is valid over a 14 day period, so you don’t need to visit the parks on consecutive days. The 14 days begin on the day that your ticket is first used. IMPORTANT: Please print 3 copies of your e-ticket. One must be handed to the driver for your outbound and return journeys. Enjoy Tenerife’s two top attractions at one unbeatable price, plus some fabulous extras! PLUS you’ll also receive one extra admission to the park of your choice. The Ultimate Twin Ticket is valid over a 14 day period, so you don’t need to visit the parks on consecutive days. The 14 days begin on the day the ticket is first used. Please arrive by 9.30am to secure your preferred times. For 1 cabana, enter "1" in the number of adults. This will book one cabana for four people. Cabanas are on a request basis and subject to availability. Maximum occupancy for your Cabana is 4 people. Photo ID (preferably a valid passport) will be required when entering the park. The name on the identification must match the name on your e-ticket. For 1 villa, enter "1" in the number of adults. This will book one villa for 8 people. Villas are on a request basis and subject to availability. Maximum occupancy for your villa is 8 people. Don’t Miss: The biggest artificial waves in the world at Wave Palace! Introducing SINGHA – Siam Park’s new ride for 2015! 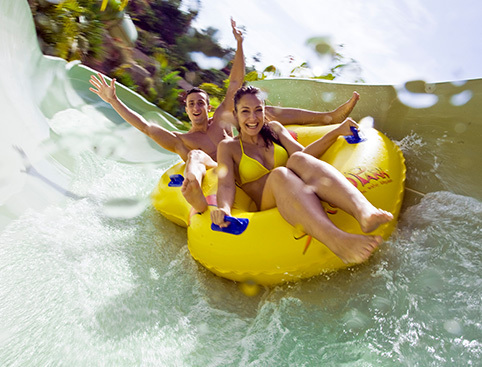 Make a splash at Siam Park Tenerife, voted by Tripadvisor as one of the best water parks in the world! At Europe's biggest aquatic theme park you can relax on the white sandy beach, drift past gushing waterfalls on the lazy river, or let off steam on the state-of-the-art rides, slides and attractions. From tots to teens to the young-at-heart, whether you’re a swimmer or a sun-worshipper, there’s something for everyone at this Thai-inspired water park! Beat the queues and make great savings by booking your tickets in advance! Our choice of tickets include all kinds of fabulous extras, such as admission to both Siam Park Tenerife and Loro Parque, the must-see animal adventure park in Puerto de la Cruz. Many of our Siam Park tickets are exclusive to UK customers and can’t be purchased at the gate. IMPORTANT: E-tickets must be printed. Tickets in digital format (smart phones or tablets) will not be accepted. Please be advised the “Tower of Power” attraction at Siam Park will be closed to the public for annual maintenance from Tuesday the 5th March until the Tuesday 19th March. Summer season: 1st May to 31st October - 9.30am to 6pm. Winter season: 1st November to 30th April - 10am to 5pm. These times are subject to change, so we recommend that you check with the park before your visit. Playa de Las Americas at Salida 29 Autopista del Sur, San Eugenio 38660, Tenerife. Parking is charged at €3 for a regular car or motorbike per day. A FREE double-decker bus service operates every 30 minutes between Siam Park and the resorts of Los Cristianos, Playa de Las Americas and Costa Adeje. Click here to see a map of the bus route! There are plenty of excellent stands, cafes and restaurants at Siam Park, whether you want a quick snack, ice-cream, sandwich or tasty full meal. 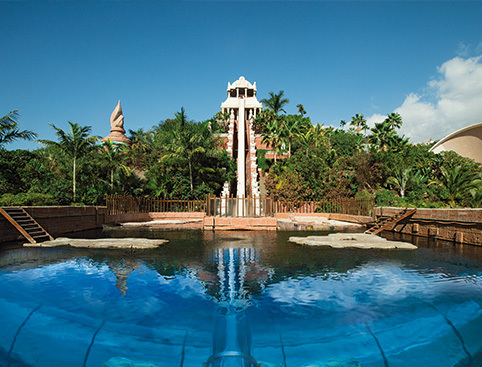 Entry to Siam Park is FREE for children aged 2 years and under. Booking a Twin Ticket? Children aged 0-5 enter Siam Park & Loro Parque for FREE and do not need a ticket. This is because Siam Park and Loro Parque have different child ticket age ranges. The Loro Parque age range applies to the Twin Ticket. If you would like to book more than one type of ticket (ie. 1-day ticket, 2-day ticket etc), you MUST make a separate booking for each ticket type. This is because you will need a separate reference number for each ticket you use to enter the park. For example: If you and your family want to visit the park 3 times, you will need to make one booking for the 2-day tickets, then make a separate booking for additional 1 day tickets. This applies to both Siam Park and Loro Parque. Both Siam Park and Loro Parque reserve the right to close rides without prior notice. In this instance no partial refunds will be provided. 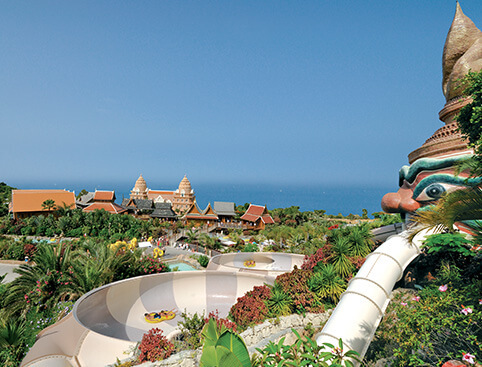 Siam Park is in Playa de Las Americas at Salida 29 Autopista del Sur, San Eugenio 38660, Tenerife. The park is situated off the TF-1 motorway which runs from north to south of the island. From Santa Cruz in the south, take Exit 28 or 29 off the TS1. From Costa Adeje in the south, take Exit 28 off the TS1. A frequent public bus service serves most parts of the island. Alight at the Playa de Las Americas TITSA bus station which is just a short walk from the park. From Los Gigantes via Playa Paraiso: number 473. From Playa Paraiso: number 472. From Las Galletas via Costa de Silencio and Ten Bel: number 483. From Santa Cruz: numbers 110 and 111. From Puerto de la Cruz: number 343. A free bus service operates every 30 minutes between Siam Park and the resorts of Los Cristianos, Playa de Las Americas and Costa Adeje. Click here to see a map of the bus route! El Duque Shopping Centre: From 9.55am then every 30 minutes until 12.55pm. Fanabe Plaza Shopping Centre: From 10am then every 30 minutes until 1pm. Ocean Park: From 10.05am then every 30 minutes until 1.05pm. El Dorado Shopping Centre: From 10am then every 30 minutes until 1pm. Best Tenerife: From 10.15am then every 30 minutes until 1.05pm. Llanos de Troya: From 10.10am then every 30 minutes until 1.10am. Pasarela Shopping Centre: From 9.50am then every 30 minutes until 12.50pm. Princesa Dacil: From 9.55am then every 30 minutes until 12.55pm. Please note that these times are intended as a guide only. To improve the service provided, times may be subject to change without prior notice. Siam Park Tickets is rated 4.8 out of 5 by 1109. Rated 5 out of 5 by 215Kevin from Best value available We've been before but paid on the gate, buying 2 day tickets in advance was better value. Just to be clear, you take your printed voucher to the gate on any day you choose and get entry for that day plus proper printed tickets to use on the second day, within 15 days from the first. This works out cheaper than inside the park, which charges 18.50 Euros for a second visit. You also get printed 5 Euro vouchers for each member the party, in our case, 3 adults and 1 child, which we used at the restaurant next to the wave pool. There was still a queue beyond the gate for a family photo, which was a bit silly for those who didn't want one. After that, queues were short except for the Mekong Rapids. You can watch the Fast Pass people walk past you or pay 15 Euros each inside the park for a wrist band to queue jump but it's not essential. The best thing in the park for us was the wave machine. Those waves are truly massive, yet still safe, because it's well organised. The waves run for about 10 minutes every hour. Rated 4 out of 5 by Joe7369 from Great water park Plenty rides for the thrill seeker. Lots of rides for all . Rated 5 out of 5 by Angie0210 from Fantastic! November is definitely the time to go, absolutely no queues at all! Rated 5 out of 5 by Sayne66 from Amazing day at Siam park Pre booked tickets in uk as it was cheaper to do so and even got a 5 euro food voucher per person! Didn’t have to que at gates as was a fast pass entry, no hassle getting in, just showed photo ID,,, great day!